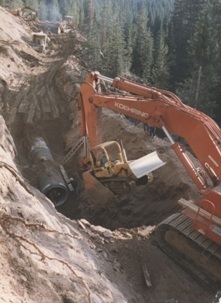 The Wyoming Water Development Program was established in 1975 to promote the optimal development of the state's human, industrial, mineral, agricultural, water and recreational resources. The program provides, through a commission, procedures and policies for the planning, selection, financing, construction, acquisition, and operation of projects. This can include projects for the conservation, storage, distribution and use of water, necessary in the public interest to develop and preserve Wyoming's water and related land resources. The commission is composed of 10 members appointed by the governor to represent the four state water divisions and the Wind River Reservation. The Wyoming Water Development Office (WWDO) is staffed by 26 professional, legal, and support employees. The Wyoming Water Development Program receives funding from severance tax distributions. Water Development Account I is utilized for new development projects. Water Development Account II is used to fund the rehabilitation of water projects that have been in existence for 15 years or longer. Water Development Account III is used to fund dam and reservoir planning and construction projects. *Attention Project Applicants * Before applying for project funding, the Wyoming Water Development Commission strongly recommends that you complete a Public Water System Survey or Irrigation Systems Survey as applicable and available through our website.